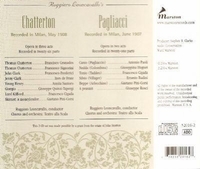 "This new version of the 1907 recording of PAGLIACCI is very welcome indeed….here it is complete and lovingly restored; the speed fluctuations on the original shellac discs are no longer noticeable, the surface noise has been reduced to a gentle stream and the joins between 78 sides are imperceptible. The first surprise is the clarity of the sound….The refurbishment process has brought forward the voices of the male singers so that the bright tone of Francesco Cigada can now be heard to full advantage…. Antonio Paoli also significantly benefits from the improved sound; his voice rings out with great intensity….Perhaps the singer who gains most from the refurbishment is Gaetano Pini-Corsi….This recording of PAGLIACCI provides a superb illustration of performance styles and standards thirteen years after the opera appeared….Ward Marston is to be congratulated on his enterprise and technical skills in producing this highly desirable set....it takes the modern listener right into the heart of the Italian verismo style that influenced operatic composition and presentation throughout the world. The original [CHATTERTON] records are extremely rare; apparently they were never issued as a set and no collection contains them all….Ward Marston is to be congratulated on his enterprise and technical skills in producing this highly desirable set." Ernesto BADINI sang mainly in Italy and South America and specialized, particularly later in his career, in buffo roles. He made many recordings and appeared in several complete operas other than PAGLIACCI including LA BOHEME, THE BARBER OF SEVILLE, and an electric recording of DON PASQUALE. He was the first Gianni Schicchi at both La Scala and Covent Garden. Francesco CIGADA sang a very wide range of leading baritone roles from Wagner to Montemezzi, Puccini, and Rossini. He never appeared in the USA and recorded only for HMV in Milan (1905-1908). He gave up his career in 1924 after the death of his only child and retired to his hometown of Bergamo. Francesco FEDERICI, beginning in provincial Italian houses, his career grew steadily. He appeared throughout Italy, in Helsinki, Havana, Mexico City, and for four seasons, 1913-1916, in Chicago. He collapsed while singing Fra Melitone in LA FORZA DEL DESTINO in Amsterdam and died there a few days later. He recorded only for HMV in Milan (1908-1912). Ines DE FRATE - the first record of her appearing in opera is of Violetta in Piacenza in 1892. She appeared as Norma at La Scala in 1898-1899 under Toscanini. Her recordings were all made for HMV in Milan including several duets with Signorini and arias from AIDA, NABUCCO, LUCREZIA BORGIA, and NORMA. There is a letter in the archives of EMI written in 1908 recommending both Signorini and de Frate to the head office of the company in England, which states that ‘Signorini has a magnificent dramatic tenor voice and sings with good school and Madame De Frate although she has had 20 years career is still a fine dramatic soprano with fine old classic school so rarely to be found among young artistes of to-day’. Francisco GRANADOS sang leading tenor roles in Spain (where he was born), Russia, and Italy between 1898 and 1908 and after that specialized in Zarzuela parts in Spain. His only recordings are those of CHATTERTON and a Pathé of ‘O Paradiso’, all recorded in 1908 in Milan. Giuseppina HUGUET was born in Barcelona and made her début there in 1889. She sang in London, Paris, Milan, and Russia. She appeared at the New York Academy of Music for one season in 1898. She retired in 1912 and taught in Barcelona. She made recordings for G & T in 1903 and for HMV in 1908. Antonio PAOLI was born in Puerto Rico, studied in Spain, and made his operatic début in Bari in 1895. In 1902-1903 he belonged to an opera troupe assembled by Mascagni that toured the USA and Canada. He frequently toured South America and in 1920 spent a season in Chicago, New York, and Philadelphia. He eventually returned to Puerto Rico to teach. His only recordings were for HMV in Milan. Gaetano PINI-CORSI, brother of the baritone, Antonio Pini-Corsi, sang for twenty seasons at the opera house in Catania and between 1892 and 1906 was regularly heard at La Scala. He sang many character parts including Mime in SIEGFRIED and Goro in the world premiere of MADAME BUTTERFLY. He was still singing in 1932 but nothing could be discovered of his life beyond that. His recordings were for HMV in Milan. Giuseppe QUINZI-TAPERGI made his début in 1908 in Palermo and was at La Scala by 1909. He sang the King in AIDA, Pimen in BORIS GODOUNOV, Boito’s Mefistofele, and Sparafucile in RIGOLETTO. His career was spent mainly in Italy and Argentina. He sang until 1935 in small parts. He recorded for Odeon and HMV before the First World War. Annita SANTORO - little is known about her career except that she appeared in provincial houses in Italy and is mentioned on several recordings of ensemble scenes made by HMV in Italy before the First World War. Young Henry is of course a pants role and it is to be hoped that, in order to appear to be a young boy, she intentionally adopted the sound she makes on this recording. Francesco SIGNORINI was born in Rome and trained at the Accademia di Santa Cecilia. He made his début in 1882 in Florence and after 1897 sang regularly in leading dramatic Italian roles at La Scala. He made guest appearances in 1907 in San Francisco and Los Angeles and also appeared in Buenos Aires. He retired in 1910 and taught in Rome. He made records for HMV and Pathé.